The 2013 Panini Father's Day promo card set delivers several layers of exclusive cards, inserts, autographs and other surprises not found anywhere else. The sophomore set includes a handful of nods to the 90s, both in designs and brands. Spanning all four major sports, the 2013 Panini Father's Day base set has 44 cards. Half of these are rookies, which come numbered to 499. Included in these are key players from the 2013 NFL Draft. Parallels include Lava Flow and Cracked Ice, both of which are numbered to 25 or less. Select cards from 2012 Panini Prizm Baseball and 2012-13 Panini Rookie Anthology Hockey Prizm Preview cards have an exclusive parallel only available in 2013 Panini Father's Day packs. Each is limited to less than 30 cards. The most recognizable inserts are Studio, which take on the look of the original 1991 Studio Baseball set. The cards feature black and white portraits that capture a ton of personality. Studio has 24 cards. 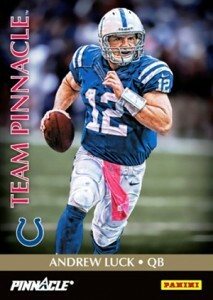 Other insert sets that delve into Panini's portfolio include Museum Collection (nine cards) and Team Pinnacle (15 cards). Elite Series returns from last year's lineup. 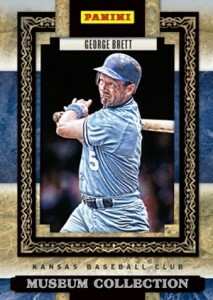 Panini has posted a preview of a lot of the baseball content here. 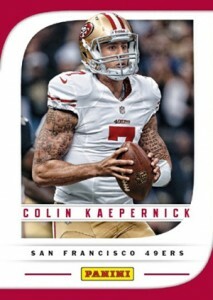 Autographs and memorabilia cards are once again a big part of the 2013 Panini Father's Day promotion. Draft Day Materials have hat swatches from some of the top youngsters in sports. Pepsi Rookie of the Week Autographs include on-card signatures from Andrew Luck and Robert Griffin III. One-of-one Diamond Cards that have a diamond piece embedded in them. Among them is a hard-signed Kobe Bryant autograph. Other hits include special Prime Hockey jumbo jersey cards of Gordie Howe, Rookie of the Year jumbo swatch cards with RG3, game-used shoe cards and Pro Bowl memorabilia cards. Tools of the Trade returns with more massive swatches of unique memorabilia. The 2013 Panini Father's Day promo set is intended to primarily drive traffic to hobby shops, giving collectors a chance at free packs for buying Panini products. There are a total of 50,000 packs produced. Want to know where the closest hobby shop is participating in the program? 44 cards. Cards 23-44 #/499. Include pieces of draft-worn hats. Featuring 37 cards. Autographs are on-card. Cards include piece of player-used item. Faulk features a glove. Barkley, Austin and Smith have a jumbo towel piece. I pulled a Kevin Durant Studio card from a Father’s Day pack, but the card is only in black and white. The back is blank. What’s that all about? Can you tell me any more about this card? Thanks! Bryan � Panini called them Printing Progressions – kind of like a printing plate and a test card. I believe I read 5 copies or less per color per card. I looked up the address for the closest participating shop and the address is somebodies house. Can I get on that list? The “Tools of the Trade” cards also have Lava Flow versions, very sharp-looking cards. Lava Flow and Cracked Ice are sweet looking!